Geoff Scott talks to the media. BUNDJALUNG elder Reg King finally has had the chance to voice his concerns about the NSW Aboriginal Land Council's recent application to explore for petroleum and gas in the region. 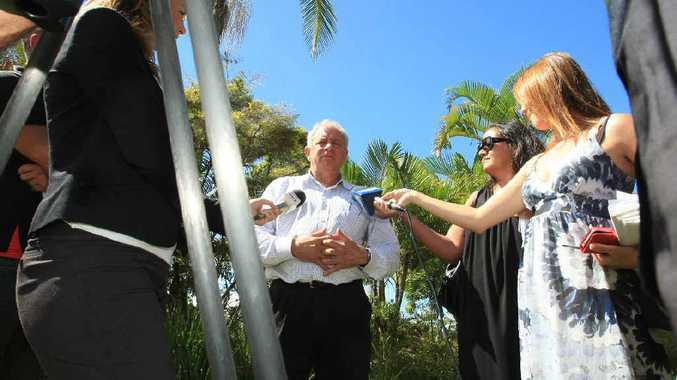 He was one of a group of Aboriginal people who told visiting NSW Aboriginal Land Council chief executive Geoff Scott what he thought of the council's plans when Mr Scott met Aboriginal community members in Lismore yesterday. "I don't want this in the Northern Rivers," said Mr King. "This was once upon a time the land of milk and honey and if we let it go this way, it will be the land of gas and toxins." Mr Scott said that, at this stage, only an application had been lodged but it had not yet been heard for assessment. "It's another half a dozen steps away before we even get to the assessment stage or if we even get it granted," he said. "So it's not an easy area to deal with. There are potential native title claimants, land councils and other interest groups and environment groups. "People are passionate about how their land is used and what happens with it. "This is an opportunity to have that discussion about the morals, the principles and the ethics of getting into the resources sector at all and in the end it will come down to the local people to decide whether we can or can't. "If the local mob says no, that we can't, then we have to take notice and listen to the people about their culture, heritage and environmental issues." Mr Scott said that the council, as an Aboriginal organisation with interests in benefits for Aboriginal communities, is better placed to be taking on the exploration task than other companies. "We'd rather have leverage on the issue than to sit back and not have any influence at all." "There is always difficulty in getting a united voice and we have to try to do the best we can about a consultation process so we can get to meet with everyone." "I'm hoping that Mr Scott will stick by his word," said Mr King. "And that he will get back to the 13 clans and there'll be no wheeling and dealing. I'm fearful about our culture and our heritage."